JOIN THE 98% OF OUR GUESTS WHO RATE US EXCELLENT OR GOOD. At Golden Goal we’re proud to provide the perfect location for your sporting needs, whatever they may be. Located in the beautiful Lake George region of New York State. We’re perfectly positioned to welcome teams from the Northeastern United States as well as Eastern Canada. air ensure the perfect training climate. YOU TAKE CARE OF THE COACHING. LEAVE EVERYTHING ELSE TO US. YOUR STAFF. PRO FACILITIES. OPTIONAL EXTRAS. The equipment coaches dream of with this unique opportunity to use elite level facilities for your needs. Four manicured grass and four pro-grade turf fields with full and small sided goals to enhance training and scrimmage possibilities. Aerial filming with drones provides the bigger picture and media center lets you share it. EVERYONE ARRIVES AS A SQUAD AND LEAVES AS A TEAM. 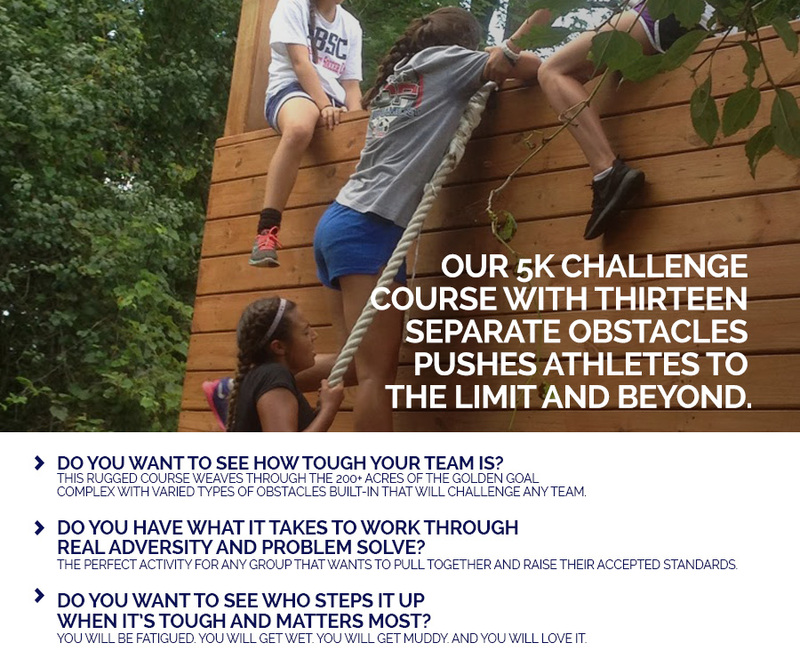 Our 5K challenge course with 13 obstacles pushes athletes to the limit and beyond. Squads don’t win championships and teams are not just assembled. Teams are built. Make sure your team is made of gold. of experience playing and coaching at the professional level can teach. reaction time, speed and agility to give the winning advantage in clutch moments.